“From what we have been conveyed through intelligence reports, information elicited from the arrested terrorists and the past incidents [of terrorism], we have declared Karachi, Hyderabad, Sukkur, Khairpur, Shikarpur and Jacobabad as sensitive,” said Sindh IG AD Khawaja during a press conference in Hyderabad on Friday. He had earlier chaired a meeting with the DIGs and SSPs from the districts of Hyderabad, Mirpurkhas and Nawabshah divisions. 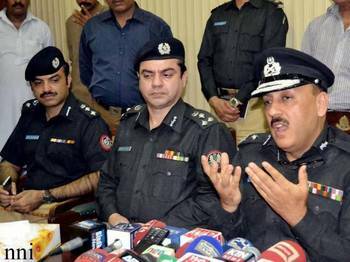 Hyderabad DIG Khadim Hussain Rind, Nawabshah DIG Farhatullah Junejo and Mirpurkhas DIG Javed Alam Odho briefed the IG about the Muharram security plan in their respective regions. According to the IG, some 60,000 policemen assisted by the Rangers will be deployed in the province while army units will remain on standby. “Suicide attacks, roadside bombs or incitement of sectarian clashes are the main security threats [for Muharram],” he explained, adding that the controversial religious figures have been banned from giving sermons during the month. He said that the LEAs have found links of Balochistan and Afghanistan-based elements in the suicide attack in Khanpur, Shikarpur, which occurred on Eidul Azha. Khawaja informed that the district administrations have been directed to liaise with the power distribution companies to ensure that the areas hosting mourning processions and majalis are not subjected to load-shedding during evenings.